The village of Applecross is on the western coast of the Applecross Peninsula, in Strathcarron, Wester Ross, opposite the Isles of Raasay, Rona and Skye. Lochcarron is situated some 18 miles due east on the other side of the winding mountain pass known as the Bealach nam Bo (Pass of the Cattle). The bay and homesteads of Applecross are in an isolated highland location, accentuated by the desolation of the high sandstone mountains of the district. The village itself was formerly known as Borrowdale, a placename that may refer directly to the village’s broch site, since it is derived from the Norse ‘borger’, a burg or stronghold, and ‘dalr’, a dale. The broch site is located on top of the south-east end of a small rocky sandstone knoll within Applecross campsite, at an elevation of approximately 40m OD (National Grid Reference: NG 71183 844331). It is likely that this outcrop was originally a moraine, related to glacial action in the area. It is located approximately 200m east of the current coast line, which forms a raised beach here. The proximity of the broch site to the sea means that winter temperatures there are neither too inclement nor extreme. 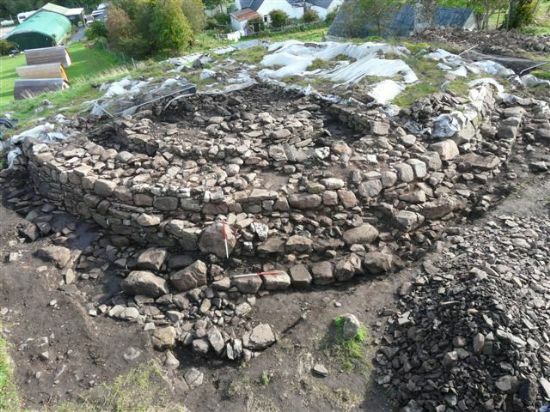 In 2006 Channel 4’s ‘Time Team’ carried out an archaeological evaluation at the site in order to determine whether the rubble remains situated on this commanding eminence at the centre of the campsite were indeed the remnants of an Iron Age broch structure. Since then the community has coordinated 4 seasons of archaeological excavation, designed to determine the extent of the broch and better understand its construction, phasing and ultimate destruction. The fifth season of excavation, undertaken over two weeks in September 2009, saw the removal of the collapse and demolition overburden of the last, SW quadrant of the site. This proved to be in a much greater state of preservation than anticipated, with external walling standing to a height of 1.2m. Of particular interest was the intramural passage containing the surviving lower steps of the intramural stairway. A later clay-lined hearth was set inside this passage, overlying the steps in a way that would only have been practicable if the passage walling was reduced on at least one side. A possible post setting adjacent to the highest surviving step indicates that the stair was probably already removed and that a temporary wooden partition or screen defined this work or cooking area. At the other end of the timescale of the site is a passageway, 0.6m wide and of as yet unknown depth, entering the structure from the west and passing under both the outer and inner walling, separated from the lowest courses of these walls by a 150mm deep deposit of mixed material overlying a compacted ashy deposit 100mm deep. The passage is cut into the natural sandy subsoil and is likely to belong to the earliest phase of use of the site. Partial investigation of this feature was made possible by the removal of an electricity pole this season, which had been inserted through the broch inner wall in the early 1960s. The southern arc of the broch wall is notable in having two outer arcs of boulder coursing. Various interpretations for these include the levelling up of a platform on which to build the main structure, a complex outer defensive walling, or the remains of an earlier phase buildings of similar dimensions to the broch where each subsequent rebuild has shifted the footprint to the structure north by a couple of metres. This last seems unlikely if only because the shift is towards the steepest side of the glacial ridge on which the structure stands. However, more evidence for an earlier structure is possibly present in the SW quadrant, where a deliberate placing of large boulders to flank an area of paving abutting onto the outside wall is reminiscent of the complex entrance of Dun Telve broch and may be the remains of a blockhouse. Investigation of an area adjacent to the broch outer wall in the SE quadrant revealed a deep linear cut, covered by large slabs. The walls of the cut were lined with vertical slabs and although this does not exactly match the description given at the time, this may be a part of the souterrain passage recorded in the 1790s. 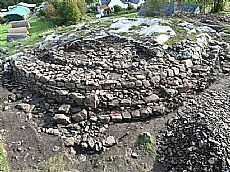 All these features confirm suspicions, raised during previous seasons that, while the structure exhibits many characteristics of a broch, this is likely to have been only one phase of a multi-phased Atlantic Roundhouse-type structure. Sixty-three small finds were recovered during this last season. The range of materials represented includes antler, ceramics, copper alloys, glass and iron. The larger percentage of the assemblage comprised stone artefacts, including coarse stone tools such as hammer, grinding and polishing stones. Of these, one round sandstone cobble of 7.4cm diameter is notable. It has both a hammered central depression and percussion marks around the circumference, consistent with its probable use as a combined anvil and hammer-stone. It was recovered from between the lintel slabs of the aforementioned linear cut adjacent to the outer wall of the broch. As such this tool is typical of much of the stone assemblage; recovered from secondary contexts, having, very possibly, been re-used or re-deposited into the construction, shoring and infilling of the contexts in which they are now found. The 2009 season saw the first indication of high status metal ware being used, at least, upon the site. Recovered at the threshold between the passage to the inner courtyard and the cooking area created close to the lower steps of the aforementioned intramural passage, it appears to be the remains of a degraded copper alloy pin, 4.5cm in length. Whilst the artefact remains appear to be comprised almost entirely of corrosion product (verdigris), it is hoped that further specialist analysis will confirm a likely date of manufacture. The recovery of a plano-convex cake of ferrous material and associated detritus measuring 11cm in diameter, formed by a run-off of tap slag collecting in a circular pit close to a smelting furnace, infers iron being smelted in a furnace heated to above 1000 degrees centigrade. It is believed that such excessive temperatures were not achieved by native Iron Age metal-workers and are more likely to indicate, at the earliest, 16th century metalworking on the site. Whilst only further specialist analysis can confirm the chronology of iron smelting on the site, the potential for an early modern context adds significantly to an already complex multi-phasing as suggested by the structural stratigraphy. Certainly, the antler comb end-plate fragment, measuring 1.9cm x 2.5cm, which was recovered from a silty loam deposit layer in the inner courtyard area, is suggestive of another period of re-use of the site. With its distinctive dot and ring decoration, on both faces, and graduated teeth, this plate fragment is readily recognisable as an element of a double sided composite comb of the types produced in Scotland in the 7th – 9th centuries. It is one of up to possibly three toothed plates that would have been fixed, with iron rivets, along a horizontal brace plate. Just as in previous seasons the majority of finds recovered during the 2009 season have been found in re-deposited and other secondary contexts – as is consistent with the project design thus far; this being to define and record the extent of the structural footprint whilst avoiding excavating to any great extent down to occupation layers. However, the range of materials and artefact types is already providing insights into both the complex chronology of the site and the diverse economy, pursuits and preferences of its occupants. The confirmation of this feature as a complex broch – Atlantic Roundhouse site is potentially enormously significant. Such sites can be immensely complex with lengthy chronological narratives. Broch site excavations are only rarely carried out. No other Wester Ross sites of this kind have been investigated and the Iron Age landscape of the area as a whole is little understood. Traditionally, brochs have been seen as rather mysterious sites and assumed to have defensive role in the Iron Age landscape. More recent excavations for example, in the Western and Northern Isles, have done much to increase our understanding of these complex sites. A final season of excavations begin this week, on the 1st June, with a community dig ongoing from the 1st – 15th, inclusive. Why not come along and visit – seeing archaeology in action and witnessing the further definition of this tremendous Iron Age settlement site; a key element in the Easter Minch Region. We can’t quite guarantee continuous sunshine or the absence of the infamous midge, but we can assure you that you will be delighted by this central point in Wester Ross’ Iron Age landscape. Ballin Smith, B., 1994, Howe: four millennia of Orkney prehistory, Edinburgh: Soc. building cultures of the Scottish Iron Age. Proc. Preh. Soc. 30, 93-146. Wessex Archaeology. 03/2006, Time Team 2005: Applecross Broch, Wester Ross, Highlands - Archaeological Evaluation and Assessment of the Results. Wessex Archaeology.